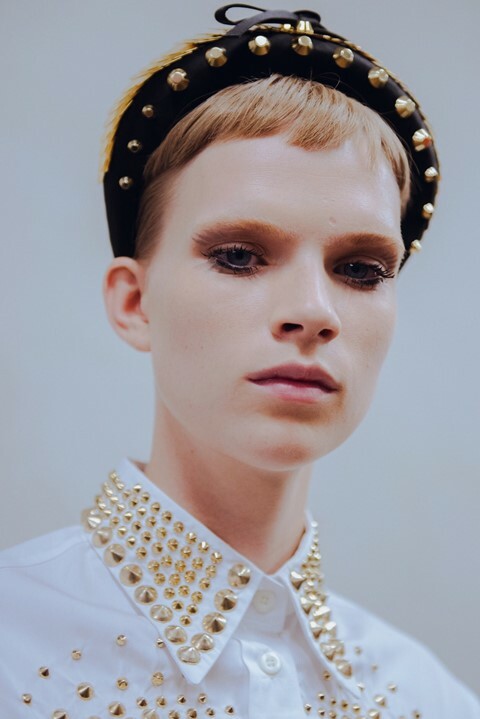 Following hot on the heels of the Fendi show, which took place in Milan earlier this afternoon, comes the one we’ve all be waiting for: Prada. Taking place in the newest building within the Fondazione Prada, Miuccia has well and truly sexed things up for SS19. Here’s everything you need to know. Guests including Violet Chachki, Amandla Stenberg, Sofia Coppola, and Spike Jonze sat on the same inflatable stools that appeared as part of the SS19 menswear show. The stools, originally designed by Verner Panton back in the 60s, sat on a grid that was mapped out on the floor which made everyone feel as if they were suspended in a computer system. ...and not just any techno, but hard, industrial techno which reverberated throughout the space. The work of Frédéric Sanchez, it was punctuated with familiar songs – Terence Hixner’s cover of The Normal's “Warm Leatherette”, and a version of “Je T'aime Moi Non Plus” by Serge Gainsbourg and Jane Birkin – which was apt, seeing as though the famous lovers’ heavy breathing and moans are not dissimilar to those made by people seeing a new Prada collection make its way down the catwalk for the first time. Eventually the track made way for dark and jarring techno again. 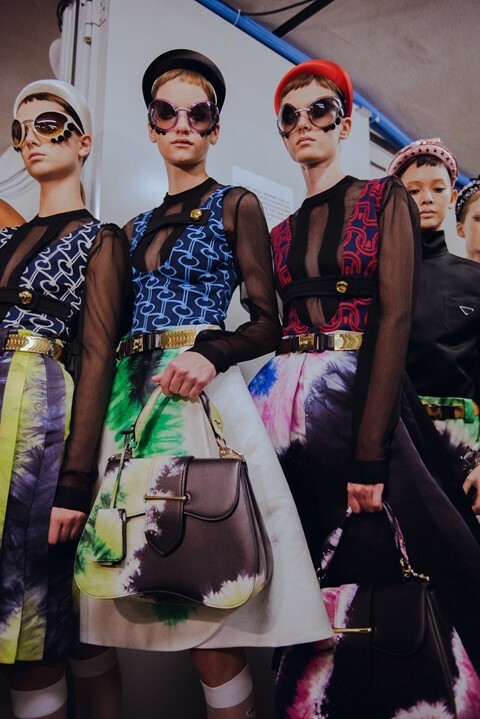 THE SEXIEST PRADA SHOW EVER? Or at least in recent memory. The first models appeared wearing satin school shorts, boxy satin shirts, and quilted, studded alice bands, before others came down the runway in low, leotard-style tops with cut-out detailing. Next came subversive, schoolgirl-esque leather trapeze dresses and ladylike coats with prim collars – although because they were paired with knee-high nylon stockings and fetish-y pointed Mary Jane heels, the look was anything but demure. The whole collection brought to mind Belle du Jour, clashed it with Mia Farrow in Rosemary’s Baby, and threw in some Secretary for good measure. Only, in Mrs. P’s hands, they’re less mid-90s Sloaney Pony and more actually v cool. Do not adjust your sets: yes, we really did just say that. Presented in jewel-coloured satin, with many embellished with crystals and studs, the style finished off basically every look. Other accessories included ladylike, structured handbags which models carried in the crook of their arm, sheer knee-highs, and black leather court shoes that bordered on the fetishistic.